Galeria Sztuki Dworcowa Wroclaw, in collaboration with All that Art! 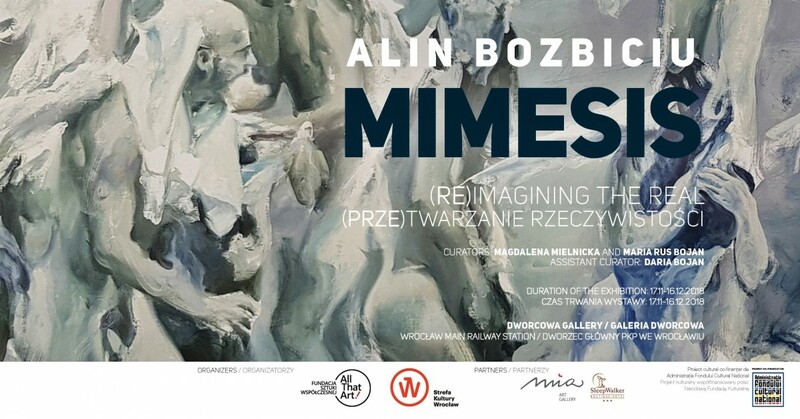 Foundation, have the pleasure to present Mimesis: (Re)imagining the Real, the solo exhibition of Alin Bozbiciu, a young Romanian artist internationally acclaimed on the European art scene. Through a series of introspective and dream-like compositions, the artist attempts to transgress the traditional perception of time and space, whilst emphasizing the infinite possibilities of painting as means to represent the many facets of the human condition and contemporary experience. By bringing together representations of angels or other imaginary characters inspired by baroque imagery, along with depictions of human bodies in ritualistic movement, the artist challenges viewers to immerse themselves in an imaginary world with a poetic dimension, in which myth and metaphor prevail. The spontaneity of his pictorial gesture accentuates the dynamic between the soft, restricted color palette, and the vigorous darker colors, offering a versatile and refreshing perspective to the medium of painting. Alin Bozbiciu lives and works in Cluj-Napoca, Romania. The young painter is one of the most successful emerging artists from the last wave of the Cluj School of Painting; graduating from the Painting Department of the Cluj University of Art and Design in 2013. Since then, he has had his works exhibited at Le Plafond, Amsterdam, Richard Taittinger Gallery in New York, and has had several shows at Untilthen Gallery in Paris. In 2017, he participated in the exhibition “Life as a User’s Manual”, the second edition of the Contemporary Art Biennial Art Encounters, in Timisoara, Romania. In 2018, Alin Bozbiciu had his second solo-show, “Theatre as Life”, at Untilthen Gallery in Paris, France, and participated in the exhibition “Time is the Game of Man”, the second edition of the summer project “Art of the Treasure Hunt” in the Chianti region of Italy, launched by Luziah Hennessy, and curated by Kasia Redzis, the senior curator at Tate Liverpool. His works are part of many important private collections across Europe: in the Netherlands, Belgium, Great Britain, Italy, France, Portugal, Germany, Slovakia, Hungary and Romania, but also across the world, in countries such as South Korea, Taiwan, China, and Japan.